So much for state's rights, never mind local rights, with every passing day the Trump administration takes on the look of the horrific Lincoln administration. Acting ICE Director Thomas Homan slammed Brown for signing SB54, which he said undermined public safety, and signaled he was prepared to take action. That statement leaves no question that the Federales care nothing about the safety of any community and merely want to make a show of strength to let the state know that the 10 Amendment is dead letter. The states need to be willing to do whatever it takes to secure their sovereignty (such as it is today). Obviously refusing to cooperate with the Feds and otherwise refusing to comply in any way, is the State Nullification route, which I would heartily endorse. They also need to utilize Interposition, and pass laws criminalizing any acts that facilitate, assist or carry-out these nefarious, federal laws. How much headway would ICE make, if state and local police were ready to arrest ICE agents for breaking state law (law which criminalized the apprehending of people on the basis of immigration violations)---? Or if all detention centers, prisons, jails, etc. 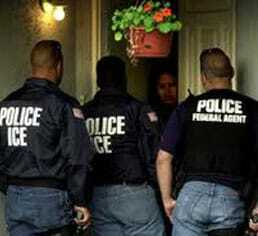 were withdrawn from being used by federal agents for the purpose of immigration round-ups, etc.--? Imagine zero cooperation by state and local police. Imagine immigration judges under threat of arrest, if through their rulings they facilitate or constructively endorse such immigration dragnets, round-ups and predations against suspected immigrants. Same with any government workers---state or federal---who aid and abet the Feds in carrying out these intrusions into state sovereignty. Things could get very ugly very soon, and that might be necessary to send the Feds a strong message. Funny these same states won't say states rights when it comes to the 2nd Amendment. Hey Franco, when are you moving to Africa or Haiti? I'm willing to bet you are a die hard racist. This needs to be done. I wish Trump would deport or encourage the removal of millions of illegal immigrants. More white Europeans need to come here. I support State's Rights and federalism 100%. That said, Trump has a weapon that even libertarians could agree with. He can just say the all EBT card transactions in CA will be declined from an effective date of [say 10 days] until he is convinced that the rolls are purged from illegal alien freeloaders. Then we will see how fast things change.